Whatever kind of business you run, invoicing is an essential part of your ability to make money and to create a good professional image. But it can be a confusing process, especially if you are just starting out in business, whether you are running a small to medium-sized enterprise or setting yourself up as a sole trader. Without knowing how to send proper, professional invoices, it can be difficult to get paid for your services in a timely manner. We’ve put together this guide to help you learn everything you need to know about invoicing and why a template for invoices can be one of the most useful items your business can have. An invoice is an important financial document that gives all the details about a specific transaction between you and a client. It lets your client know how much money they owe you and details the goods and/or services they are paying for. Your invoice also tells your client how you expect to be paid, such as by bank transfer or PayPal, for example, and gives them details of how they can make that payment. In addition, it shows them the date you expect payment by, enabling you to keep your books balanced and stay on top of late payments. An invoice also serves some other extremely important purposes. It provides a record for you and your client, which you will both need to use in your bookkeeping. For you, it serves as proof of the work you have done and the amount you charged for it. For your client, it details the products or services they bought, and how much they paid for them. This information is essential for your tax returns. This is a lot to expect from one small document. So how can it be done? By including all the right information on your invoice. What information needs to be included in an invoice template? This may sound obvious but the word “Invoice” needs to be displayed prominently at or near the top of the document. If you forget to include it, your client may not realize the document is important so it could be put aside and forgotten. Your invoice needs to include the name, address and phone number of your business. These show the client which company the invoice is from and also give them a way to contact you in case they need to ask anything about the invoice. Giving each invoice a unique reference number makes your invoices much easier to track. It also makes it clear which invoice the customer is referring to if they have a query or are making a payment. Unique reference numbers are usually allocated in numerical order. They can also include a code specific to that particular client. Your invoice should include the name, address and phone number of your client. This makes it easy for you to identify which customer is making the payment. It also gives you their details instantly if you need to chase a late payment. This shows the customer when the purchase was made and how long they have to pay the invoice. Most businesses offer the client a grace period of seven, 14 or 28 days to make the payment, starting from the issue date of the invoice. Once this period has expired, the payment becomes late. You need to include the due date so you know when to start chasing payments. Your invoice needs to state clearly the total amount owed to you by the client to avoid any confusion. Your invoice needs to include details of exactly what the client is paying you for. This could be a single item, such as a laptop, for example. But it might also include charges for other items such as software or services like installation. It is important to detail each individual item and what it cost, as well as the total amount of payment due. If the customer orders multiple of the same item, you don’t need to list each one individually; you can abbreviate, for example, 10 laptops @ $500 per unit = $5,000. This is fine as long as it makes it clear to the customer exactly what they owe and what for. This list covers the absolute basic amount of information which needs to be included on an invoice in the USA. Other countries have different laws about the requirements for invoices. For example, in the UK, if your business and your client are both registered for VAT, your invoice will also need to include the VAT amount. In Australia, invoices also need to provide the Australian Business Number (ABN) of your business, and the GST amount, if applicable. It is important to check what the law is regarding invoices in the country where your business is based. Every document you send needs to reinforce the professional image of your business in the minds of your clients. This is especially the case with invoices, as they contain a lot of important information. All of this information needs to be presented in a way which is clear, concise, and as easy as possible for your clients to understand when reading it quickly. Remember, they are as busy as you are! The quality of your invoices has a direct impact on the amount of repeat business you receive. If your invoices are tidy and professional-looking, and can easily be read and understood quickly, this demonstrates that you are a company which understands the needs of your clients. If it also includes your company branding, this is even better, as it reinforces the awareness of your brand for your clients and shows that you have taken the time to create professional-looking documentation so that you will be taken more seriously. This will make your clients more likely to want to work with you again in the future. For maximum impact and ease of use, it is worth using an invoice template designed by a professional company which has your needs in mind. This way, you can easily make sure all the relevant information is included, and that it is presented in a clear, user-friendly way for maximum client appeal. Firstly, the template needs to present all the relevant information in a clear and straightforward way which is easy to read. Your clients should not have to spend a lot of time trying to make sense of your invoices. This is also important for you, as time is precious when you are running a business, so you need a template which can be completed quickly and easily. Secondly, you don’t want to be restricted to only doing business when you are in the office. This means you need an invoice template which enables you to create and send invoices on a variety of different devices, so the template should be downloadable in a number of the most popular formats, including PDF. In addition, a good invoice template will be backed up by high-quality software which makes life even more convenient for you by enabling you to create and send invoices from anywhere at any time. Finally, your template for invoices should be easy to customise. It needs to be adaptable so that it can suit all the needs of your business and your different clients. It also needs to be able to include your company branding, as this instantly creates a more professional and memorable image. Billdu is a solution that makes invoicing quick and easy for small to medium-sized businesses and sole traders. Designed with your specific needs in mind, it enables you to create and send a professional-looking invoice in seconds, with a simple invoice template that contains all the information you and your clients need. It is easy to customize so you can include the essential branding which sets your business apart from the rest, giving you a distinct advantage in today’s marketplace. This simple and effective template for invoices is backed up by an intuitive app that is available for iOS and Android, as well as an online-based software solution for PC. This means you don’t have to be in the office to create and send your invoices – you can do it from anywhere in the world. It also makes it easy for you to track invoices, and give your customers a simple, instant payment option by adding a Pay button. You can download our sample invoice template for FREE by clicking on the button below. 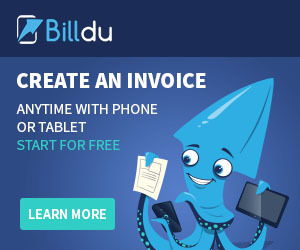 or try Billdu today and create professional invoices in a few clicks!